Most of us know that exercise and fitness are important components of virtually every stage of life. However, during menopause, changing hormones can create a host of uncomfortable and distressing physical, mental and emotional symptoms, all of which can leave you feeling overwhelmed and miserable. Therefore, it is during the menopausal transition that you may find the benefits of exercise particularly significant. The challenge, however, can be to begin an exercise program or – if you are already exercising – to kick it up a notch so that you can feel a renewed energy and relief from menopause symptoms. 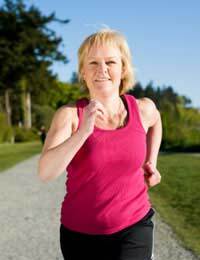 How Does Exercise Benefit the Menopausal Transition? Women who exercise regularly can experience benefits to their heart and in particular, their bones. Exercise stimulates the new production of bone, thereby imparting strength and mass to the bones. This bone health becomes important during menopause because the loss of oestrogen – a hormone that provides a protective effect – means that women are more susceptible to thinning bones and they are ultimately more likely to suffer from osteoporosis. Women who exercise regularly are also more likely to maintain their weight and enjoy more stable moods and a strong sense of well-being. A good exercise and fitness routine for women after menopause should include a number of components: cardiovascular, strength and flexibility. For cardiovascular exercise, you should aim for approximately three sessions a week for twenty minutes or longer. Some people like to perform High Intensity Interval Training (HIIT), which involves pushing yourself hard for several minutes, then reducing intensity for a brief period before increasing it and working hard again for several minutes. This type of training is thought to result in a higher level of calories burned in a session. For weights, you should perform weights with free weights or machines between one and three times a week, aiming to take turns working each muscle group and allowing for adequate rest in between. Don't forget that you can incorporate fitness in many ways, so even during a short lunch break, you could try to get outside and go for a quick walk. If you have never exercised before – whether you are slim or overweight – you should speak to your doctor. In particular, those women who are aiming to lose weight will want to speak to a doctor or dietitian about healthy food choices to accompany their exercise routine. You can end up with an injury if you overexert yourself too soon and you may feel worse, rather than better when it comes to your menopause symptoms. Those who are already exercising can set short-term and long-term goals. For instance, next week try to walk an additional half a mile and increase your weights on the machines or try for extra repetitions. The body does adapt to exercise, which means that challenging yourself can improve your health while also providing a sense of mental accomplishment. Whether you are new to exercise and want to lose weight or you are simply looking to shake up your routine a bit, exercise and fitness are extremely important during the menopausal transition. Not only can the release of endorphins leave you feeling happier and less moody, but the physical benefits mean that you are improving your health, relieving some of your menopause symptoms and looking your best.